A simple stir fried beef with oriental gravy sauce with cashew nuts and broccoli. You can cook this dish for lunch or for dinner. Actually this is an oriental dish but you can enjoy this dish with your Pinoy taste buds. As much as possible, choose tender parts of the beef like tenderloin or sirloin so it will not be tough when you cook it. Overcooking will also tend to make the beef tough too so be careful not to overcook the beef. 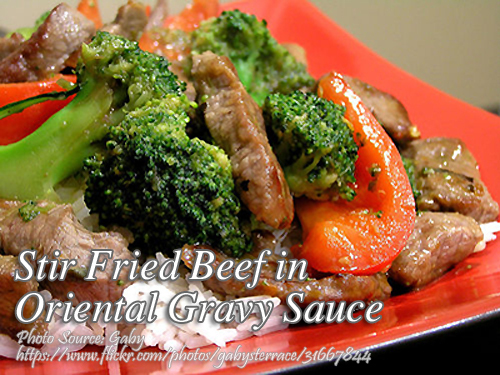 To cook stir fried beef in oriental gravy sauce; Combine first 7 ingredients in a bowl and mix well. In a skillet, over high heat, brown sirloin in oil and add cashew nuts. cook for 2 minutes. Add gravy mixture and bring to a boil. Simmer for 1 minutes or until thickened. Top with blanched broccoli. A simple stir fried beef with oriental gravy sauce with cashew nuts and broccoli. You can cook this dish for lunch or for dinner. Actually this is an oriental dish but you can enjoy this dish with your Pinoy taste buds. Combine first 7 ingredients in a bowl and mix well. In a skillet, over high heat, brown sirloin in oil and add cashew nuts. Cook for 2 minutes. Add gravy mixture and bring to a boil. Simmer for 1 minutes or until thickened. Hey Manny! I love the combination of broccoli and beef! Thanks!